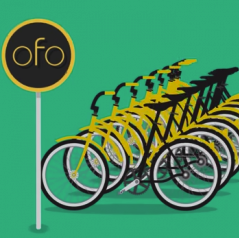 Ofo, a Beijing-based start-up company that has become the world’s largest bike-sharing platform, is joining forces with the United Nations Development Programme to raise public awareness about climate change. The partnership will also provide financial support to innovative projects that address urban environmental challenges, expected to reach 100 million people, including school children, with campaign messages about the adverse effects of climate change. Uber partner Didi Chuxing is one of the partners in Beijing Bikelock Technology, the $500 million company behind Ofo, and which was only started in 2015. UNDP and Ofo will also establish a joint scholarship program to support environmental research projects and will provide small grants to start-ups offering green products and technologies. Ofo currently has over 30 million people using its app to share bicycles in China, Singapore and the US (and shortly the UK, too – with a controversial scheme in Cambridge) will donate its income on the 17th of each month to celebrate the 17 Sustainable Development Goals. These “Global Goals” were agreed upon by nearly 200 nations to eradicate poverty and inequality by 2030.